R10000-UNWSBXT is rated 4.6 out of 5 by 177. Rated 5 out of 5 by Merlee from Excellent Design, Gteat product My bath does not have seperate shutoff valves. Once I sweat in the plumbing to this valve I coud shut off these valves built into this rough in fixture and turn on the water source to the rest of my home. This allowed me to complete this project with water still available to my home. Rated 5 out of 5 by R J I from Easy to adjust Can find the temperature I want instantly. Rated 5 out of 5 by Jim B from Great valve Used for shower only. Easy to install. Being that it’s universal there are many options for faucets. Delta’s customer service is second to none when it comes to honoring their warranty. Great company and great valve. Thanks. Rated 5 out of 5 by GMC 1 from Extremely easy to install ! Replaced another kitchen faucet that wasn't a Delta, the delta is so much better quality, easy to install and if it last as long as the rest of the delta products I have in my home, I shouldn't have to replace this one for a long, long time. Rated 5 out of 5 by Whitmore from Great warranty So pleased with products and warranty that we replaced all kitchen and bathroom fixtures with Delta fixtures. Rated 5 out of 5 by Arizona67 from Great features Love the pressure it puts out. I am wanting to convert my single handle Price Pfister tub &amp; shower set to a delta. Which universal adapter would I need for this and would it also be possible to choose a set which has the separate temp control when my current one is not that type? 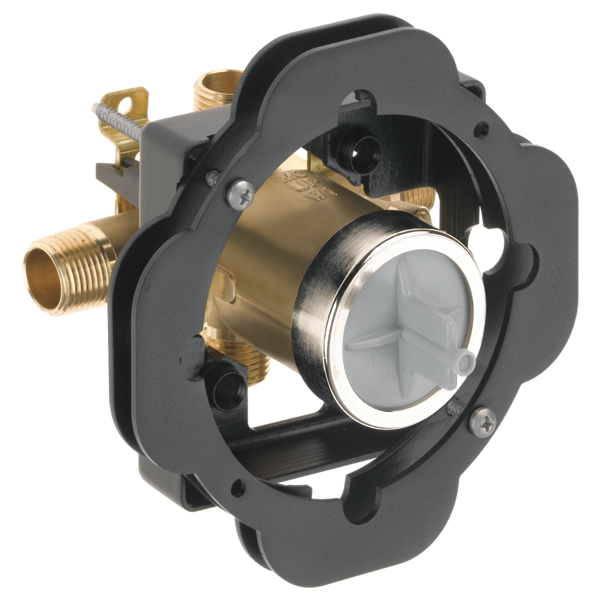 Just ordered r1000-unwsbxt tub/shower valve. I am replacing an old 3-handle valve with the use of a remodel plate. My problem is distance between the tub spout and faucet centers can only be 7 &quot; max. Will this cause stacking? I need to replace the trim package on my existing Monitor 1700 Series shower valve. The existing cartridge is an RP32104 (white top, single tab on left). The valve body seems to be an older model that has screwdriver stop assemblies soldered to both sides and the threaded screw holes for the escutcheon trim screws are both on the bottom of the side of the body. All of the replacement trim packages show the screws on the lower left and upper right so they don't line up with the screw holes on my valve body. The new mounting brackets don't seem to provide an access to the screwdriver stops. Is there an adaptor or some other way to mount a new trim package to this valve body? Thank you for your question. Unfortunately there is not a trim that will fit your current valve body. You will need to replace the valve too. We recommend Delta Faucet model # R10000-UNBX multi-choice valve. Or if you want to keep the screwdriver stops like on your current valve, then we would recommend Delta Faucet model # R10000-UNWS. This would allow you to turn the water off at the valve for servicing instead of the whole house. I bought the Delta MultiChoice R10000 Can I use threaded brass fittings for my connections? I live in a high rise and i want to purchase this calve. Pressure in my unit is close to 100 psi. Will this valve work properly? I need to order the proper fitting in order to install our delta faucet set. I cant figure out the difference between&nbsp;R10000-UNBX and&nbsp;R10000-UN. Also is there a three neck hook-up version?